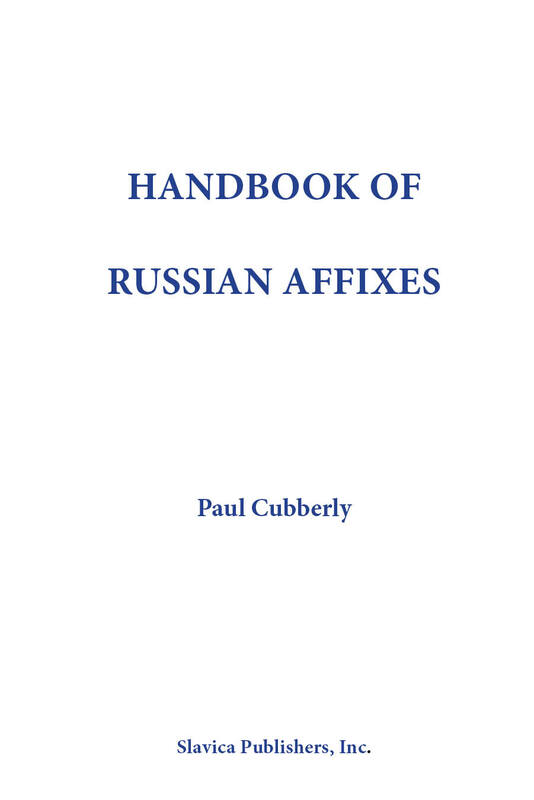 This is a concise dictionary of Russian affixes, classified into Prefixes (total 60) and Suffixes (Nouns -- 219, Adjectives -- 100, Verbs -- 20) -- a grand total of some 390 affixes, which is a virtually exhaustive list of all Russian affixes. It is a much fuller list than is found in either Townsend's Russian Word Formation or Gribble's Russian Root List (both also from Slavica). Affixes are subdivided by morphological category (noun, verb, adjective, and other). The following data are given for each affix: 1) one or more descriptive names or English meanings; 2) its formal derivation (what sort of base is used), including foreign vs. native status, and -- for the suffixes -- comments on the foreign origin; 3) morphonological information (sound/letter alternations); 4) associated stress rules; 5) usually two examples with English translation; 6) for suffixes: references to the relevant section of the 1980 Academy Grammar for further examples and information (several of the affixes included in Cubberley's book do not in fact occur in the Academy Grammar). There is a general introduction on Russian word-formation, and specific introductions explaining the format of each section. There are two cross-referencing sections: one classifies all affixes according to the morphological category to which they can be attached, and the second does the same for suffixes in relation to eleven high-frequency semantic categories. There is an index allowing all affix entries to be traced easily. Finally, there is a section of exercises for either private use or in a classroom, and a Bibliography. The Handbook is aimed mainly at the intermediate Russian learner, who needs to increase vocabulary as quickly and as efficiently as possible. The principle is that formal word-formation in the form of affix study is one of the best ways of doing this. "Therefore, this Handbook surely belongs on the bookshelf of every serious student of the Russian language... (SEEJ).